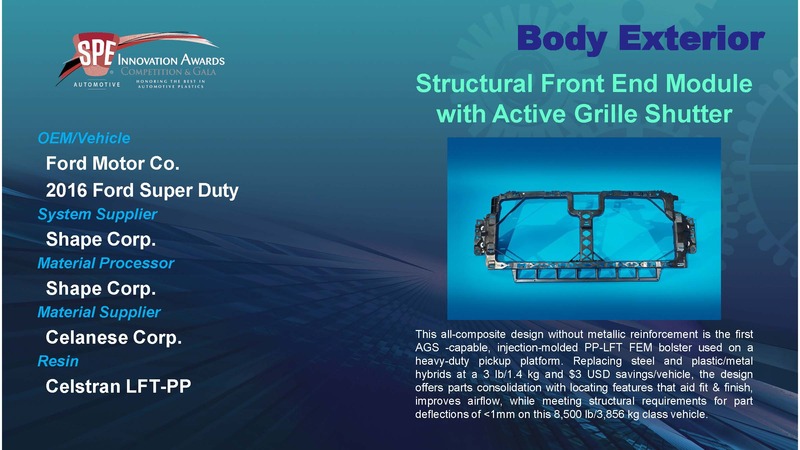 The Structural Front End Module with Active Grille Shutter on the 2016 Ford Super Duty pickup from Ford Motor Co. was the Body Exterior Category winner in the 46th-annual SPE® Automotive Innovation Awards Competition. System supplier and material processor, Shape Corp. and material supplier, Celanese Corp. also were named on the award. For more information, see http://speautomotive.com/inno and http://speautomotive.com/awa . 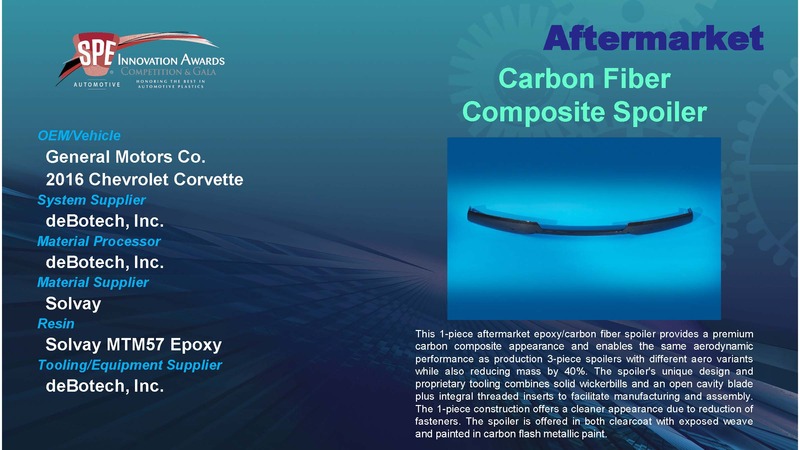 The Carbon Fiber Composite Spoiler on the 2016 Chevrolet Corvette sports car from General Motors Co. was the Aftermarket Category winner in the 46th-annual SPE® Automotive Innovation Awards Competition. System supplier, material processor, and tooling/equipment supplier, deBotech, Inc. and material supplier, Solvay also were named on the award. 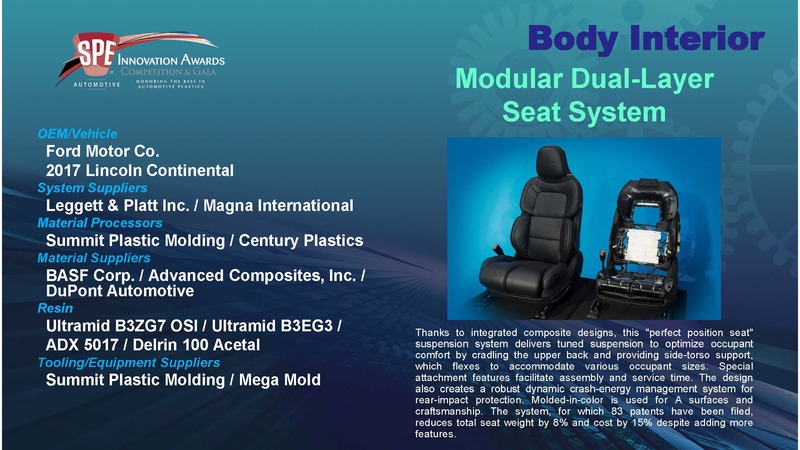 The Modular Dual-Layer Seat System on the 2017 Lincoln Continental luxury sedan from Ford Motor Co. was the Grand Award and Body Interior Category winner in the 46th-annual SPE® Automotive Innovation Awards Competition. System suppliers, Leggett & Platt Inc. and Magna International; material processors, Summit Plastic Molding and Century Plastics; materials suppliers, BASF Corp., Advanced Composites, Inc., and DuPont Automotive; and tooling/equipment suppliers, Summit Plastic Molding and Mega Mold also were named on the award. The board of directors for the SPE® Composites Division have named Dr. Uday Vaidya, University of Tennessee/Oak Ridge National Laboratory (UT/ORNL) governor’s chair in Advanced Composites Manufacturing and professor in the Department of Mechanical, Aerospace & Biomedical Engineering (MABE) at University of Tennessee-Knoxville (UTK) as well as chief technology officer for the Institute for Advanced Composites Manufacturing Innovation (IACMI) as the recipient of the group’s 2015-2016 Composites Person of the Year award. Vaidya was recognized at a special ceremony during the 2016 SPE Automotive Composites Conference & Exhibition (ACCE), September 7-9 in Novi, Mich. in the Detroit suburbs. 2014-2015: Dan Buckley, American GFM (Lifetime Achievement). In addition to his academic responsibilities, in his current role at IACMI, Dr. Uday Kumar Vaidya chairs the technical advisory board, oversees technology roadmapping efforts, and helps shape high-value industry-led projects for the institute. Since joining UTK, he also has led the establishment of the 10,000-ft2/929-m2 Fibers and Composites Manufacturing Facility (FCMF) to serve IACMI and the Tennessee Manufacturing Ecosystem. 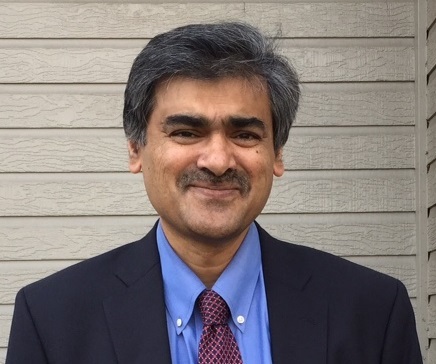 Prior to joining UT/ORNL, Vaidya served as department chair for Materials Science & Engineering and as center director for the Composites Center at University of Alabama at Birmingham (UAB). He also helped establish and then, as director, led the Materials Processing & Applications Development (MPAD) center at UAB, which focused on leading-edge manufacturing and commercialization of engineered plastics, polymers, fibers, composites, and metal castings. During his career, he has contributed extensively to research and development of engineered polymers, fibers, and composites and has experience with a broad range of composites for defense, transportation, and industrial applications. Additionally, he has served as principal investigator (PI) or co-investigator (Co-I) on more than 100 projects worth over $22 million USD to date. Vaidya has 29 years’ teaching experience at five academic institutions (UTK, UAB, North Dakota State University, Tuskegee University, and Auburn University) where he has developed and taught a variety of engineering courses to students from freshmen to graduate levels, and has been recognized with a variety of prestigious teaching awards, including Outstanding Faculty Member Award for the College of Engineering at UTK (2016), the Presidential Teaching Award for Excellence at UAB (2005 and 2013) and also UAB’s Graduate Dean’s Excellence in Mentorship Award (2014). In 2001, he received the Outstanding Teacher of the Year award at North Dakota State University’s School of Engineering, and received the Outstanding Faculty Award for Research in 1996 at Tuskegee University. A prolific writer, Vaidya has been published in over 180 peer-reviewed international journals and over 350 conference proceedings. He has contributed four book chapters, is the author of Composites for Automotive, Truck and Mass Transit, a book published by DesTech Publishers, and he is completing a second book on Composites for High Schools, Community Colleges, Hobbyists and Freshmen Engineering Students. He also contributes extensively to organizations and events such as SPE, CAMX (the Composites & Advanced Materials Expo), SAMPE (Society for the Advancement of Materials & Process Engineering), the ACMA (American Composites Manufacturers Association) and ICCM International (the International Conference on Composite Materials) as a session organizer, panel discussion coordinator, presenter, exhibitor, invited speaker, and think-tank discussion participant. Furthermore, Vaidya has organized several conferences and workshops himself dealing with composites and plastics research and education. His contributions were recognized in the August/September 2012 issue of CM (Composites Manufacturing) magazine as a B.E.S.T. (a bright, energetic, skilled trailblazer) from across the composites industry. An entrepreneur as well, Vaidya is a principal and co-founder of Innovative Composite Solutions (ICS), an Alabama company that was established in 2009 after winning first place and $100,000 USD in the Alabama Launchpad Competition that year. ICS has commercial ventures with high-tech, lightweight composite products for the infrastructure/buildings, power transmission, defense, biomedical devices, and commodity markets. Vaidya also has served as consultant for a number of companies producing fiber-reinforced plastic piping, power/energy, and plastic products. He holds a B.S. degree in Mechanical Engineering from Karnataka University in India where he was first in his graduating class. He earned an M.S. degree in Mechanical Design Engineering at Walchand College of Engineering (also in India) and received a doctorate in Mechanical Engineering at Auburn University in the U.S.
Held annually in suburban Detroit, the ACCE draws over 1,000 speakers, exhibitors, sponsors, and attendees and provides an environment dedicated solely to discussion and networking about advances in transportation composites. Its global appeal is evident in the diversity of exhibitors, speakers, and attendees who come to the conference from Europe, the Middle East, Africa, and Asia / Pacific as well as North America. Fully one-third of attendees indicate they work for automotive and light truck, agriculture, truck & bus, or aviation OEMs, and another 25% represent tier suppliers. Attendees also work for composite materials, processing equipment, additives, or reinforcement suppliers; trade associations, consultants, university and government labs; media; and investment bankers. The show has been jointly sponsored by the SPE Automotive and Composites Divisions since 2001. The 17th-annual SPE ACCE will be held September 6-8, 2017 at The Diamond Banquet & Conference Center at the Suburban Collection Showplace, 46100 Grand River Avenue, Novi, MI 48374. For more information about the SPE ACCE, see http://speautomotive.com/comp.htm, or http://specomposites.com. The Automotive Division of the Society of Plastics Engineers (SPE®) today announced the Safety Category finalists for its 46th-annual Automotive Innovation Awards Competition, the oldest and largest recognition event in the automotive and plastics industries. Nominations were first subjected to a pre-qualification review and then were presented before a panel of industry experts on September 29-30, 2016. That panel sent forward the most innovative nominations (category finalists) to the Blue Ribbon judging round, which was held October 10, 2016. Category and Grand Award winners selected during the Blue Ribbon judging round will be announced on the evening of November 9, 2016 during the 46th SPE Automotive Innovation Awards Gala. Tier Supplier/Processor: Royal Technologies Corp.
Material Supplier / Toolmaker: Celanese Corp. / Vortec Tooling Solutions, Inc. Description: For the first time, a polymer composite has replaced magnesium in a structural seat-cushion frame and under-seat storage lid for a front center 20% seat with integrated restraint system. The application is weight neutral and lower cost (≈$4 USD/unit), and satisfies all safety and crashworthiness requirements. Its flexible architecture allows for updates with future enhancements. Injection molded 40% LFT-PP is used to mold the frame, which also features an expanded polypropylene (EPP) antisubmarine foam block and a lockable ergo-latch. The assembly represents a significant reduction in carbon footprint vs. magnesium and has yielded 2 awarded and 2 pending patents. Tier Supplier/Processor: Yanfeng USA Automotive Trim Systems Company, Inc.
Material Supplier / Toolmaker: LyondellBasell / ToolPlas Systems Inc. Description: Minimizing door intrusion during side impacts usually requires intensive body-structure countermeasures. Abdomen criteria for 5th and 50th percentile dummies are primarily driven by door-trim armrest stiffness during side impacts. This new door-trim armrest improves safety as a tuning component by acting as a load limiter and absorbing energy. Comprised of a skin, foam pad, PP-nonwoven trampoline fabric, ABS armrest substrate, and PP trampoline frame, the system is significantly softer than previous designs, substantially outperforming static and dynamic functional requirements without adding countermeasures, cost, or weight. Further, armrest durability improves 6 times, and costs and weight are reduced $31.80 and 3.8 kg per vehicle. Description: This patent-pending, plastics-intensive, modular composite front seat-cushion pan (in impact-modified 35% GR PA), side-airbag deployment back panel (in talc-filled TPO), and power head-restraint drive nut (in POM) create a robust and dynamic crash-energy management system for front impact protection, side airbag deployment, and energy management for occupant impact protection. Further, the system enables modular assembly and scalable features for assembly ease. Already 83 patents have been filed and 12 granted on this innovative seat system. Interested in attending this year’s event? There is still time to buy individual tickets or tables of 10 seats. Register here. The Automotive Division of the Society of Plastics Engineers (SPE®) today announced the Process, Assembly & Enabling Technologies Category finalists for its 46th-annual Automotive Innovation Awards Competition, the oldest and largest recognition event in the automotive and plastics industries. Nominations were first subjected to a pre-qualification review and then were presented before a panel of industry experts on September 29-30, 2016. That panel sent forward the most innovative nominations (category finalists) to the Blue Ribbon judging round, which was held October 10, 2016. Category and Grand Award winners selected during the Blue Ribbon judging round will be announced on the evening of November 9, 2016 during the 46th SPE Automotive Innovation Awards Gala. Description: The zipper clip is a plastic solution that gives the holding benefits of a stud-and-nut combination while reducing production limitations. Ideal for use where a nut is desired but not feasible, this is the first stud insert with 4 ratcheting control features and a self-centering 2-way locator that holds over 120 lb/54.43 kg of weight while it requires low ergonomic effort (5.11 lb/2.32 kg) for assembly. The design reduces spring back as well as weight and cost and eliminates the need for assembly equipment as well as an isolator, since it protects the stud from corrosion. Description: Hot-gas welding joins both halves of this 35% GR-PPA thermostat housing assembly. The part has a small welding-flange footprint but high weld strength because there is no fiber/material degradation during the joining process. In fact, it is the only welding process that permits bridging of glass across the joint. The weld distance is held within 0.1 mm, enabling parts to package into very limited spaces with tight tolerances. Since the part is not touched during welding, there is no sticking. Versus previous aluminum solutions, the PPA assembly is 30% lighter and 40% less costly. Description: A redesigned capacitive touch lens produced via 2-shot molding eliminates molding defects while maintaining an ideal bonding surface and clear aperture for best light intensity. Eliminating a second tool, the Fresnel pattern is molded into the core of the first shot, which becomes the cavity of the second shot as the latter is layered over the former, keeping both outer surfaces smooth. Using 2 grades of PC with a 40o difference in heat-deflection temperature (HDT) eliminates the problem of the second shot melting the first during overmolding. Eliminating a tool reduced costs 25%. Description: A hydraulic punch and sonic welding operation was replaced by robotic laser cutting and welding of a Class A exterior fascia. Unlike other welding processes, it is not necessary to thicken wallstock in weld areas to prevent readthrough with robotic laser welding of brackets on the backside of the part, and that reduces weight slightly. It also eliminates the need for contoured horns and punches. Clean cuts can be made in 1 sec on the painted side of the part. The dual-function process provides greater flexibility between programs and reduces floor space and tooling costs. Tier Supplier/Processor: Yazaki North America Inc.
Material Supplier / Toolmaker: DuPont Automotive / Yazaki North America Inc. Description: This tool-less, single-lever, self-locking underhood bussed electrical center (UBEC) guarantees proper connections for 4 connectors from 4 different wire harnesses using 1 hand and low assembly effort. There is no need to re-orient the UBEC to install mating connectors during OEM assembly. The result is a robust, high-circuit-capacity design that s ergonomically friendly to assembly-line workers. Additional benefits are a 7% weight savings, 8% additional spare electrical content, 10% reduction in overall footprint, better water-ingress protection, and 30% less assembly time. The Automotive Division of the Society of Plastics Engineers (SPE®) today announced the Powertrain Category finalists for its 46th-annual Automotive Innovation Awards Competition, the oldest and largest recognition event in the automotive and plastics industries. Nominations were first subjected to a pre-qualification review and then were presented before a panel of industry experts on September 29-30, 2016. That panel sent forward the most innovative nominations (category finalists) to the Blue Ribbon judging round, which was held October 10, 2016. Category and Grand Award winners selected during the Blue Ribbon judging round will be announced on the evening of November 9, 2016 during the 46th SPE Automotive Innovation Awards Gala. Tier Supplier/Processor: Hua Tao Ltd. Description: This is the first air-intake manifold launched in China using 35% GR-PP to replace PA 6/6. The application provides 25-30% cost reduction and 15-20% molded-part weight reduction while retaining properties at high temperatures and improving weld strength, andNVH levels by 5 dB. Unique technology involving finer glass fibers and special sizing helps meet performance requirements. Parts are vibration welded. Description: To boost fuel efficiency and reduce emissions on classic small-block pushrod V8 engines, an inexpensive and simple technology called active fuel management (displacement on demand) was developed. The efficient and precise electro-mechanical hydraulic system deactivates cylinder valves when power is not needed, then reactivates them when power is called for again. An important component of the system’s solenoid control valves is injection molded from 30% GR-PEI. The material is used for its high stiffness, creep resistance, thermal and chemical resistance, high knitline strength, and ability to be ultrasonically welded. The system improves fuel efficiency 5.5-7.5% and reduces cost 30% vs. metal. Tier Supplier/Processor: ABC Group, Inc.
Material Supplier / Toolmaker: BASF Corp. / ABC Group, Inc. Description: To meet more stringent fuel efficiency and tailpipe emissions requirements, engines increasingly are being downsized and turbocharged, but that raises temperatures and pressures that underhood components see during operation. For example, charge air ducts, which take air from the turbocharger to the throttle body, can see continuous-use temps as high as 220C and pressures as high as 207 KPa. Further, compact packaging space requires efficient designs. Switching to a heat-stabilized PA 6/6 capable of being 3D flashless blow molded reduced mass 30-40% and cost 20-25% vs. metallic designs.